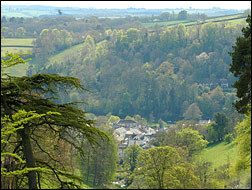 Dulverton is known as the Southern gateway to Exmoor. There are many places to stay in and around Dulverton, B and Bs, hotels and self catering holiday cottages. The town stands between the rivers Barle and Exe which converge a mile or so down the valley. Standing next to the Barle at the western end of Dulverton is Exmoor House, the headquarters of the Exmoor National Park Authority. The town has several streets of shops including a butcher, NatWest Bank, Post Office, fish & chip shop, greengrocer, late-opening supermarket, art gallery, hairdressers, guns and fishing tackle shop. There are a number of quality boutiques and interesting gift shops. Lewis's Tea shop and Woods restaurant are very popular. The Tong Dam Thai restaurant has an intimate atmosphere and first class food. Just along the road is the National Park Information Centre, which shares premises with the local public library. The Guildhall Heritage and Arts Centre is situated behind the National Park Visitor Centre/Dulverton Library. Open seven days a week from Early April to the end of October, with free admission, it gives visitors a taste of old Dulverton, a main exhibition which changes either annually or every 2 years plus a varied programme of short term exhibitions. 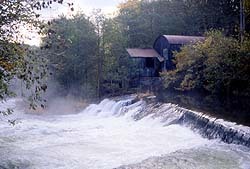 The River Barle provides good trout and salmon fishing. The Lance Nicholson gun and tackle shop in Dulverton High St. provides advice and kit. The Caravan Club site behind the National Park HQ is best approached from the South. Visitors with caravans, trailers etc should avoid the centre of Dulverton as the roads are narrow with sharp bends. There are a GP doctors practice, a dentist and a veterinary surgery in the village centre. There are many walks from the town - the riverside walks both ways along the Barle being very popular. The wild open moorland of Winsford Hill on Exmoor is just a few miles North up the Barle valley from here. The Bridge Inn is (not surprisingly!) next to the bridge over the River Barle. The inn dates from 1845 and has great ales and good food. Cosy, friendly, cyclist-friendly B&B in Dulverton. Ideal Exmoor location, with the town's pubs and restaurants on your doorstep. Choice of cooked breakfasts, with homemade cakes and sourdough breads. A rural and romantic hideaway offering three luxury en-suite bedrooms, guest lounge with woodburning stove & fabulous candlelit dinners. This stone farmhouse & converted barn accommodation boasts a wealth of original features including exposed stone walls and beams. Enjoy exploring the tracks & footpaths leading from the garden into woodland & wild meadows, then on to Dulverton, 2 miles away. Sightings of the Exmoor Red Deer are frequent at Streamcombe. A unique & special place to stay. Your ideal base for discovering the hidden delights of Exmoor, Devon and Somerset. You will receive a warm welcome, with all meals cooked from local produce whenever possible. Comfortable lounge, bedrooms and restaurant serving afternoon teas, dinners, and a hearty breakfast. Ample parking, assistance with baggage and dog friendly, all set in the beautiful surroundings of the Exe Valley. We’re a small, family run B&B in the heart of Exmoor National Park. We have lovingly refurbished our grade II listed farmhouse to create a contemporary, yet cosy, rural retreat. This is an excellent location for walking, cycling and many other outdoor pursuits - with fantastic, log fired, pubs servicing amazing food and many tea rooms nearby for you to unwind and totally relax. Dogs and children over 12yo welcome. Traditional pub and b&b with six en-suite letting bedrooms overlooking beautiful rural surroundings shaped by the river Exe. We offer a warm welcome and comfortable bed and breakfast accommodation featuring stunning views of either the river or open countryside, on the gateway to Exmoor. We only serve freshly prepared home made food, specialising in fish and shellfish as well as game in season, and we are proud to support our local producers. 14th C Farmhouse B&B fully modernised to provide top quality B&B in 2 en-suite rooms. Four Poster bedroom with glorious views across the Devon Countryside. Family room with private bathroom. 2 miles Dulverton. We also provide horse accommodation and transport for 4 horses - we can collect and deliver your horses if required. See website for details. Charming 200-year-old farmhouse with 2 double & 3 twin bedded rooms all with spacious en suite bathrooms (or showers), televisions, tea/coffee making facilities & wonderful country views. Ideal for parties, family reunions, birthday celebrations or friends just having a break together. Wimbleball lake is just 150 yards from the garden, a fisherman's paradise. Plenty of space to unwind in the large sun lounge that has spectacular views over the garden & lake. Cosy sitting room with log fire. Dinner optional. Children of all ages are most welcome we have a cot, high chair & playroom. Winsbere House, Bed and Breakfast Accommodation, is set in pretty gardens with lovely country views on the edge of Dulverton. This B&B is just a 10 minute stroll to the town centre facilities and a short drive to Tarr Steps, Wimbleball Lake and Exmoor. 2 double and 1 twin room, ample parking, cyclists and walkers welcome. Ideal base from which to explore Exmoor, North Devon and West Somerset. Set in secluded grounds on the edge of Exmoor, Three Acres is the perfect country house for those who want to relax in England's most beautiful countryside. A licensed bar, sun terrace, sitting room with log fire and plenty of space make your stay as comfortable as it could possibly be. The six bedrooms, all individually styled have superb facilities and delightful views. Breakfast, which is prepared fresh to order using home grown and locally sourced produce, has won Taste of the West Gold Awards three years running and “South West's Best Bed & Breakfast 2008”. Light homemade suppers are served at the bar or we can recommend excellent restaurants and country pubs in the area. Tarr Farm is set in the most beautiful location overlooking the Ancient Clapper Bridge of Tarr Steps and the River Barle. Excellent accommodation. Award winning, locally sourced lunches and dinners in our warm and welcoming restaurant and gardens. Huge scones accompany our famous cream teas. Morning coffee, Hearty sandwiches, Romantic dinners - whatever your choice, you'll find it at Tarr Farm. Once a farm building, the Cowshed is now a delightful, all-year-round, 2 bedroom holiday home affording spacious accommodation for 4 in a tranquil setting 2 miles from Dulverton. At an elevation of 1000 ft asl it affords lovely views over the Barle Valley and to Dartmoor. It is a 3 mile walk to Tarr Steps and the Exmoor Pony Centre is just up the road. Retaining the original stone pillars and a vaulted ceiling in the living area, the accommodation is on one level, is south facing with a veranda and has its own parking in a gated yard, secure for dogs and young children. Set in the heart of Dulverton and forming part of an Old Chapel, this two bedroomed property affords luxurious accommodation at the gateway to Exmoor. A fully equipped modern kitchen, spacious, comfortable lounge featuring 32in flat screen television, DVD player and stereo. Two comfortable bedrooms, one double bedded, the other with two singles and a bathroom fitted with a large shower cabinet and separate bath. Dulverton is the gateway to Exmoor and has a number of excellent restaurants and local pubs. Cycling, walking, fishing and horse riding are available locally. Haddon End is a fine 5 double bedroom family house on the Somerset/Devon border with large gardens set in the unspoilt Brendon Hills, on the edge of Exmoor National Park. It has been renovated over the last 20 years and is a perfect base for walks and expeditions around Exmoor. Sleeps 10 +2 people, has 3 bathrooms, a large farmhouse kitchen and double size (30’) sitting room. It is south facing so the terrace outside is a wonderful spot for sitting out and enjoying a meal or a glass of wine. All the modern facilities you would expect – wifi, free-sat (satellite) TV (42” plasma) etc. Delightful rural cottage with 2 double bedrooms all on the ground floor, 2 miles NW of Dulverton. No pets. Ideal for allergy sufferers. Spacious accommodation including lounge with log burner, bathroom with shower over bath and WC, separate WC, modern fitted kitchen. Central heating included. Gardens and private off-road parking for 2 cars. Superb for walkers, kite flyers, star gazers, mountain bikers and nature lovers. Two 4 star cottages - Buzzards & Toads Breech - in a converted stone barn high in the Exe valley above Dulverton, (4 miles away) surrounded by our own fields and stunning views, sleeping 2 and 4 plus cot. The combination of old character of uneven walls and oak beams with modern high quality furnishing and fittings (central heating and log burners), gives high comfort in all seasons. Enjoy a peaceful haven away from the pressures of modern life - walk in and relax with your beds made up, all towels, electricity, heating, logs, and more, included - even dog towels. Our delightful 200 hundred year old detached former coach house is found nestling into the hillside overlooking the genteel town of Dulverton with its pubs, restaurants and shops all just a short stroll away. Guests comment on the high standards of furnishings & equipment throughout including cosy log fire, leather suite, modern fitted kitchen and en-suite bedroom with luxurious pocket sprung bed - everything to ensure you fall in love with Exmoor! Two apartments each sleeping 2 persons, in a large secluded house with lovely views overlooking 60 acres of its own woodlands and the Exe Valley. 1 mile from Bampton. A peaceful and secluded self catering unit adjacent to our farmhouse, in a lovely wooded valley on the southern slopes of Exmoor. Situated on the Two Moors Way, it is ideal for walkers, cyclists and riders, or just to relax and visit the many places of interest nearby. Well equipped and furnished, there is a conservatory with lovely views, a private garden with patio furniture and climate control. Well behaved dogs are welcome. Unwind in one of our spacious but cosy, character detached cottages, carefully converted from stone barns, tucked away in an idyllic rural setting on the edge of Exmoor. Each has its own private fenced garden, ideal for dogs and their owners! Fully central heated and with stoves. Enjoy excellent walking, see the wild Exmoor ponies on the moor just minutes away! Fly fishing and water sports available at Wimbleball and Clatworthy Reservoirs. The stone cottage, which is newly converted to a very high standard with full central heating, is but a short walk from Wimbleball lake and 1 mile to the east of Brompton Regis village. With panoramic views over the lake and surrounding countryside, it is an ideal base for fishing, sailing, walking and bird watching and a perfect starting point for exploring Exmoor National Park. Set in its own grounds with a sheltered south facing terrace, the living area has a log burner and the modern kitchen is fully equipped including washing machine and dishwasher. Two bedrooms - one twin bedded, one single and the bathroom complete the accommodation. Whitehall House is a first floor, two bedroom, self-catering holiday apartment conveniently situated in the centre of Dulverton. Located at no.19 the High Street (front door on left of picture), the first floor apartment offers fully equipped, high quality accommodation for up to four persons plus a baby in one double, and one twin bedroom. Situated on the border of Devon and Somerset, we make the most of the fine local produce that the area has to offer. We specialise in fish and shellfish from the West Country and game in season - locally sourced from Exmoor. All of our food is home made and freshly prepared to order. We have acheived the Taste Of The West Silver award for our commitment to locally sourced produce. We serve fine wines including local Exe Valley Wine and a selection of cask ales. Large parties are welcome as we have a private function room available. We are happy to tailor menus to any taste and budget. Fish & Chips, Burgers, Kebabs. "Best fish and chips for miles". Cooked to order, so allow 10 minutes.